Fifteen years ago I began working with Active Older Adults at the YMCA. I worked there for 5 years and then found a job at Lake Prince Woods a continuing care retirement community. I get to do the programming for the residents in our Residential Living. The folks I get to work with are the reason I Walk. The before and after of Alzheimer’s has been an education for me. From being active in exercise classes to being bedridden, from going on all the outings to being unable to find their room, from lead singer to mute, from husband and wife to patient and caregiver I’ve worked with folks through the realities of the disease. I see one resident in particular whenever I reflect. She lead all of our exercise classes, she showed our movies, called bingo, made popcorn, rode around campus on an awesome contraption that was both a bike and a scooter. She loved the beach and had an amazing collection of beach glass. As she began the gradual process I watched her and her husband and children. I will always have them in my heart and the lessons learned from her. I love the residents of our community and I walk for their future and mine. At Home Instead Senior Care®, our tagline is “To Us, It’s Personal®.” The only way we can fulfill our mission to enhance the lives of aging adults and their families is by being personally committed to increasing awareness of the issues seniors face. 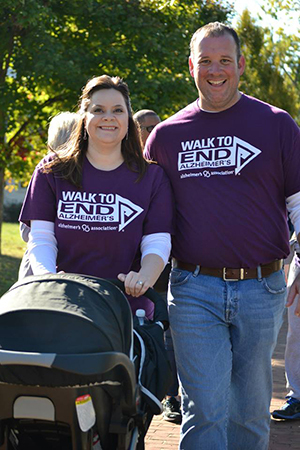 We see first-hand how Alzheimer’s disease affects seniors and their families, and our network is committed to raising funds to help end this disease forever. Hollie and Chuck Bradley participate in both the Peninsula and Williamsburg Walks. Their company, Home Instead, is a National Team. Growing up, I’ve always had a fascination with the brain and all of its’ many functions. Whether it be relating to areas of psychology or to the field of neurosurgery, I was captivated by the brain! I remember having to give a presentation on Dementia for my physical education class in high school and how confused yet intrigued I was with the research. I then learned about what we call Alzheimer’s. You know the saying, “the shot heard around the world”? Well, I consider Alzheimer’s to be the disease felt around the world. I view it at such because it is an illness that possibly bares more weight on the caregivers and loved ones just as much as the person living the disease. Fast forward about 5 years and it will be around the time I received terrifying news from my mom regarding my own Grandmother. Alzheimer’s is something I’ve read about online but now it became personal. I felt like I had just stepped in the ring with the disease itself, fighting round for round to help save my Grandmother’s life. It’s been about two years since I’ve received the news, and each day is just as shocking as the last. Not too long ago, my sister told me how my Grandmother drove to Drug Co which is no more than 5 minutes away from her home and as she went to go back home, she could not remember how to get back. That was the red light that went off in my head that this is real, this moment is real and it was a scary feeling. When I go to North Carolina to see her with my family, I start to see the obvious signs of Alzheimer’s slowly starting to take over. My Grandmother is a woman full of so much life and energy. She is filled with so much Joy and has a heart bigger than this world. She turns 79 in May and as her wisdom only increases, her youthfulness remains steady. So why do I walk? My Grandmother has the greatest impact behind my reason but I do not just walk for her. I walk for others who are also dealing with such a heavy burden. In school we’ve always been taught that “the mind is a terrible thing to waste”, well I am learning just how true that is. Alzheimer’s to me is like the garbage man, taking out the trash when really it was never really trash at all. Memories should be of a lifetime, they should have no expiration date. 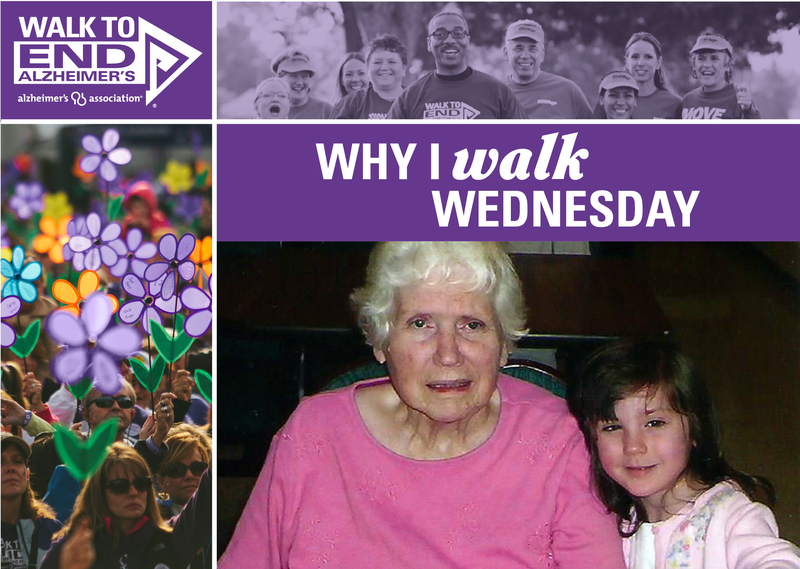 I walk for those similar to my Grandmother who may not fully understand what Alzheimer’s is but knows her memory is not quite the same. 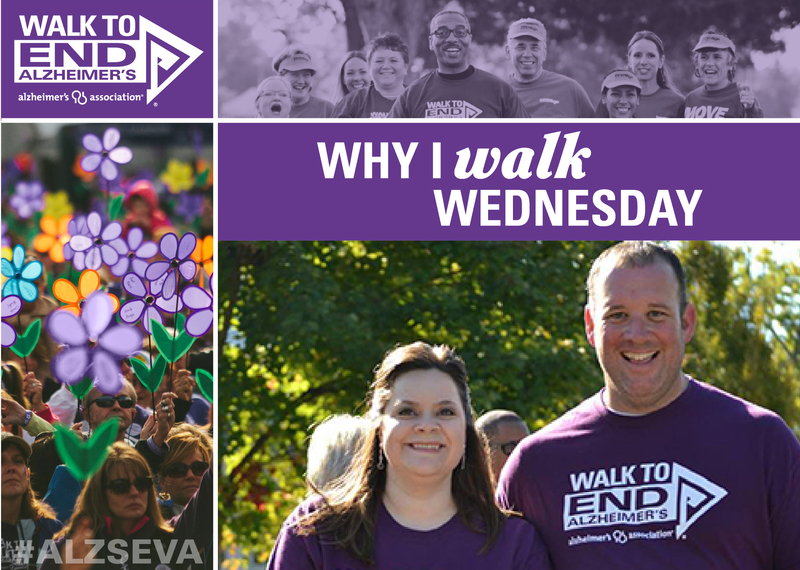 I walk for those whose voice has been stolen from them due to this horrible disease. Alzheimer’s is not my friend, it is a robber of memories and a murderer of the youthfulness in the soul and spirit. I also walk for hope, understanding, courage and the regaining of power, not just for me or my Grandmother but everyone affected. It is up to us, the caregivers, and the loved ones to continue to step up and fight. Let’s help prevent this from happening to others in the future. Instead of our memories, let’s turn the tables and put an expiration date on the perpetrator itself, Alzheimer’s disease. 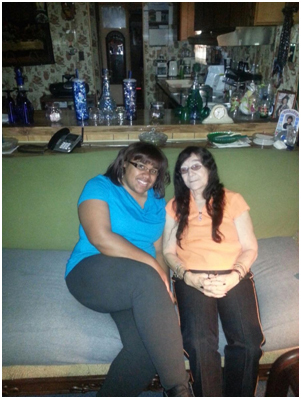 Whitnee Rawles and her Grandmother. Mother’s Day 2007 when Hannah was three and half years old and great grandmother was 82 years old. Eleven year old Hannah Smith in her own words. 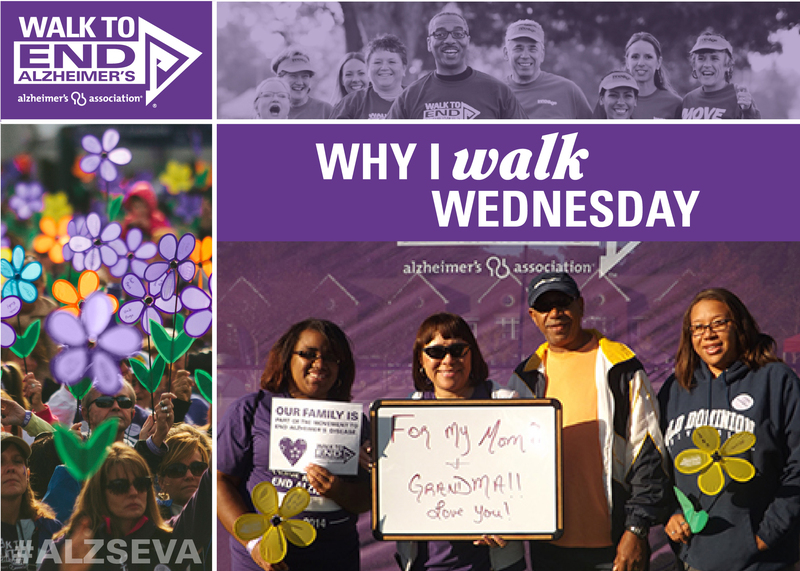 I walk because my great grandmother and grandpa had Alzheimer’s. 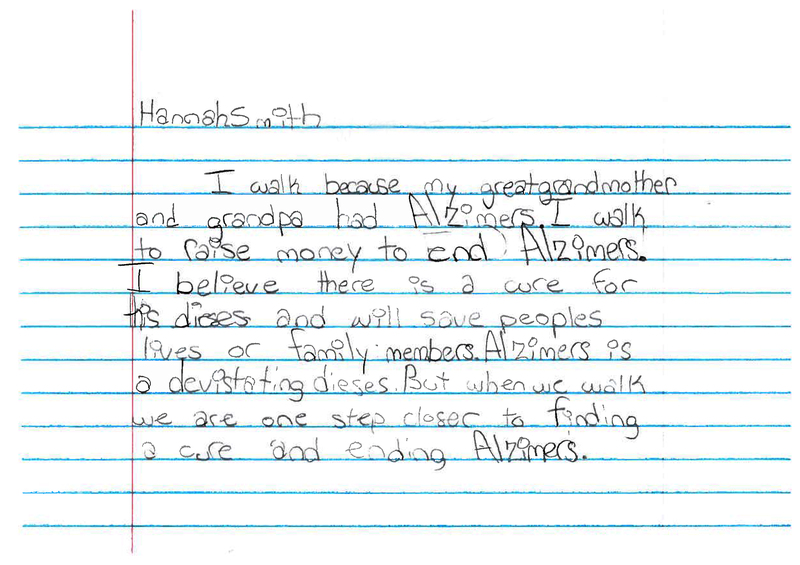 I walk to raise money to end Alzheimer’s. I believe there is a cure for this disease and will save people’s lives or family members. Alzheimer’s is a devastating disease. 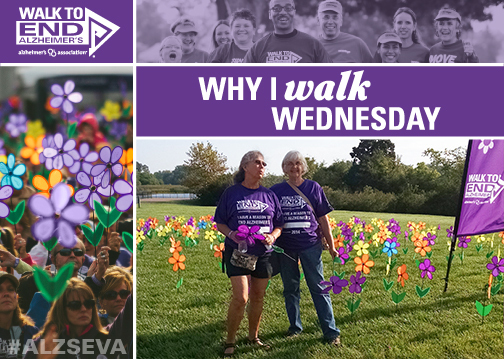 But when we walk we are one step closer to finding a cure and ending Alzheimer’s.